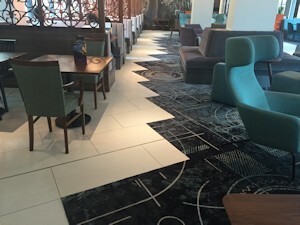 We have many years’ experience of commercial tiling work and we have developed excellent working relationships over the years with some of the world’s largest and most professional brands including Pizza Hut, Subway, David Lloyd and Novotel. In addition to these brands, we work with significant partner companies in our industry who continually refer work to us because of our commitment to customer service and quality of our finished tiling work. These partner companies include E Jordon Refrigeration, Indecs Contracts, Bathstore, Vincent Stokes and APSS. We have excellent partner relationships with these organisations not only because of our service commitment but also because of our product knowledge and experience which means that no matter what the tiling application is, or the type of tile required, we will have a solution in place. Our team of tilers at DM Tiling are all time-served craftsmen, and many of our staff have been with us since the company’s inception. Our teams skills and product knowledge is continuously updated through the provision of training courses run by product manufacturers, specific outside agencies and local colleges. Some of our staff are on modern apprenticeship schemes which provides an excellent launching pad for their careers. The combination of experience and education in our workforce allows us to provide our outstanding end results. DM tiling is a CITB accredited company.